Pittsburgh-based corporations PNC Financial Service Group and PPG have played integral roles in the development of sustainable architecture. 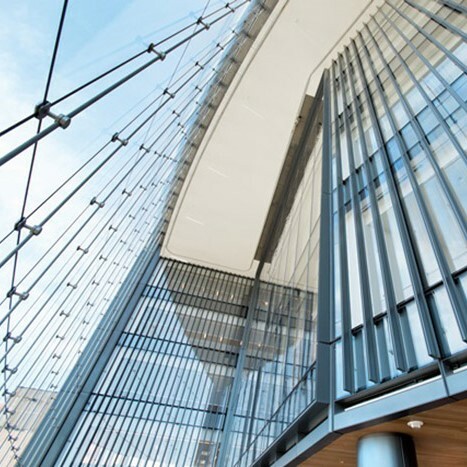 PNC has more newly constructed LEED® (Leadership in Energy and Environmental Design)-certified green buildings than any company in the world, while its Steel City-based neighbor is the only building products company in the world to offer customers such as PNC single-source access to sustainable glass, coatings and paint. 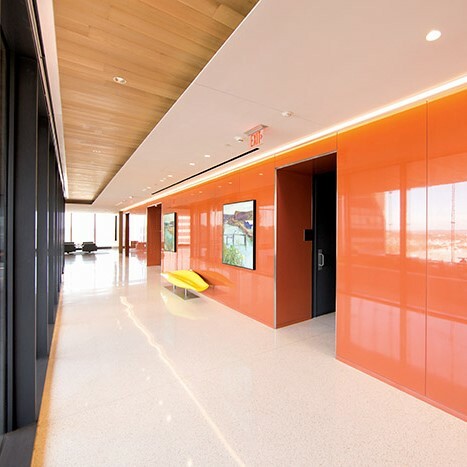 Given their proximity and history, it’s no surprise that PPG products have figured prominently in many of PNC’s signature architectural projects, including its boldest yet: The Tower at PNC Plaza. Opened in 2015 and designed to be one of the greenest office buildings ever built, the 33-story high-rise appears on the surface to be a conventional glass-and-steel skyscraper, yet the sleekly polished exterior hides a second glass façade that architectural firm Gensler designed, along with a rooftop solar chimney, to create a “breathing” building that uses fresh air and solar energy to naturally cool, heat and ventilate itself for much of the year. The solar chimney consists of two vertical shafts located at the core of the tower, topped by a thick slab of concrete that is painted black and covered with glass. The black paint absorbs the heat and warms the concrete, which creates a stack effect at the top of the chimney. When the building automation system senses that conditions are optimized for natural ventilation, it automatically opens the operable windows and vents on the interior and exterior facades so that air can enter the building, warm naturally, then rise and escape through the solar chimney. In natural ventilation mode, which is expected to occur up to 42 percent of the year, the building can operate without fan power or electricity. The net effect of the ventilation scheme is to continually introduce fresh air into the building while reducing temperature-related energy consumption by up to 50 percent compared to similar-sized buildings. Coraflon Sunstorm Powder Fluoropolymer Metal Coatings played a key role in this project. Based on FEVE resin technology, Coraflon Sunstorm powder coatings deliver exceptional durability and weatherability in a wide range of colors and glosses, including the sparkling mica finish featured on The Tower at PNC Plaza. Like traditional liquid fluoropolymer coatings, Coraflon Sunstorm FEVE powder coatings and DURANAR® PVDF powder coatings feature equivalent performance that meets or exceeds American Architectural Manufacturers Association (AAMA) 2605 specifications for weathering, corrosion resistance, chemical resistance and other criteria on marquee building projects. Inside The Tower at PNC Plaza, orange Manor Hall paint and Coraflon ADS powder mica gray coatings decorate the core walls at the elevator entrances, while Speedhide latex, Speedhide zero latex paints, and Pitt-Glaze water-borne acrylic epoxy colors such as Delicate White, Asparagus, Knight’s Armor, Black Magic and Glowing Firelight adorn offices, access areas, service centers, production rooms, restroom entrances and other spaces. All PPG paints and metal coatings specified for The Tower at PNC Plaza were selected for their low-VOC (volatile organic compound) emissions, durability and appearance. In striving to create the greenest office tower in the world, PNC, Gensler and their partners constructed a building that was designed to surpass LEED Platinum certification, the U.S. Green Building Council’s highest rating. Not only do these strategies enable The Tower at PNC Plaza to consume 50 percent less energy than benchmarks buildings of its size, but the high-rise also bathes more than 90 percent of its workspace in natural light. PPG Paints is a trademark and Coraflon and Duranar registered trademarks. The PPG logo is a registered trademark of PPG Industries Ohio, Inc. Manor Hall, Pitt-Glaze and Speedhide are registered trademarks of PPG Architectural Finishes, Inc. LEED is a registered trademark of the U.S. Green Building Council.